Frailty is characterised by reduced strength, endurance and physiological function, an increased vulnerability to stress and falls, and health issues such as disability and memory problems. ​help seniors keep muscle mass loss at bay. Before she started exercising regularly, retiree Kok Ho Moi, 72, had fallen five or six times, either in the bathroom or while she was cycling. In her youth, Madam Kok had no time to exercise as she often worked 12-hour days in her family’s wholesale clothes distribution business. She retired after it closed in the 1990s. After her falls and with plenty of urging from her eldest son, the widow decided to take better care of her health nine years ago. She joined the Choa Chu Kang Fei Yue Retirees Centre and began taking part in activities like group exercise, singing and arts and craft. She also makes home visits to needy seniors as a volunteer. “I feel very good. When we’re old, we should exercise and keep our minds nimble,” said Madam Kok, who has three other children and four grandchildren. Without the exercise, she would probably be in a worse condition as she is considered “pre-frail”, which means she is at risk of poor health. She is not alone. A local study conducted from 2015 to 2016 found that more than one-third of 1,051 elderly folk aged 65 and above could be characterised as pre-frail. Six per cent of participants were frail. Having less strength and feeling tired more easily is part of the effects of muscle loss, said Dr Samuel Chew, a senior consultant in geriatric medicine at Changi General Hospital. People reach peak muscle mass in their 20s and start losing muscle in their 40s – at a rate of 7 to 8 per cent per decade, he said. 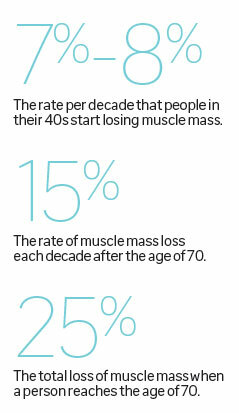 The rate of muscle loss doubles to about 15 per cent each decade after the age of 70. “Once we reach 70 years old, we can expect to have lost about 25 per cent of our muscle mass as part of the ageing process,” said Dr Chew. Skeletal muscles, which are attached to bones, are the most likely to weaken. Studies have shown that there is a greater loss of fast-fibre muscles found in skeletal muscles, particularly those responsible for generating powerful contractions and carrying the weight of the body, he said. The lower limbs also experience a greater loss of muscle mass and function, compared with the upper limbs, said Dr Chew. The difference in muscle loss could be due to the varying patterns in which we move our limbs – the upper limbs have quick and more repetitive movements, while the lower limbs move more slowly and less repetitively. The result is that it becomes more difficult for the elderly to perform simple everyday tasks, such as climbing the stairs, lifting objects and even getting up from a chair, said Dr Melvin Chua, who heads Sengkang Health’s department of general medicine, geriatric medicine and internal medicine. “As muscle loss progresses, older people may reduce their physical activities which, in turn, can lead to their being more and more deconditioned (loss of muscle tone and endurance),” he added. 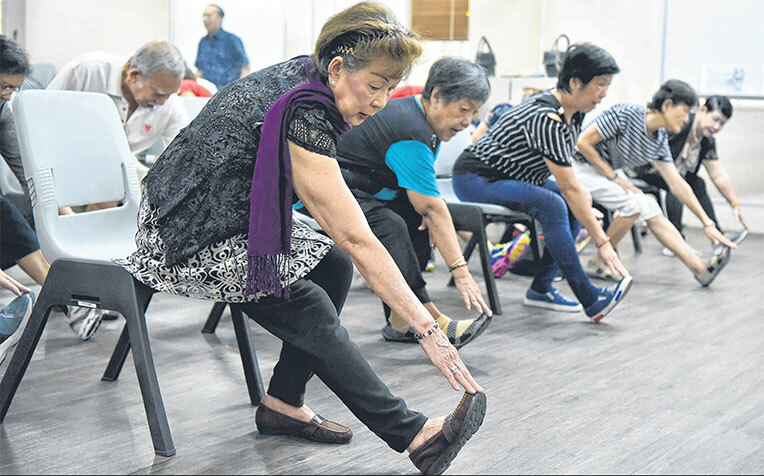 Another reason the elderly do not exercise at a rate that is optimal for them is a fear of falling, said Dr Carol Tan, a geriatrician from The Good Life Co-operative at Mount Alvernia Hospital. However, the lack of exercise results in muscle loss which, in turn, increases the risk of disease, falls and fractures, she added. While muscle loss is part of the ageing process, geriatricians said that factors like prolonged illness, a diet high in fat and carbohydrates but low in protein, and a sedentary lifestyle can exacerbate it. In addition, he said, any disease which leads to inflammation, a decline in hormones such as oestrogen, or diseases directly affecting the muscles or nerves can accelerate muscle loss. The other culprit is a lack of protein in the diet. Protein is an important component of muscle and it is needed to maintain healthy muscles as people age, said Dr Tan. She recommends that seniors get their daily protein requirement by eating eggs (follow the two egg whites and one egg yolk a day rule) – which are easy to swallow and are one of the cheapest forms of protein. Or they can opt for fish such as cod, mackerel and salmon, which contain omega-3 fatty acids. However, she said, fish is one of the more expensive forms of protein and some seniors may, instead, fill up with carbohydrates which are cheaper, like rice. Some seniors may not eat enough protein because of medication that suppresses their appetite, or due to illnesses that make it difficult to eat regular food. They may also have poor oral health, such as fewer teeth or poorly fitted dentures. Dr Tan said these adults can take oral nutritional supplements with meals or to replace a meal. Physical exercise that includes elements of resistance or weights is the most effective in slowing the progression of muscle loss, compared with light aerobic exercise, said Dr Chew. “Resistance and weights-training specifically target the musculoskeletal system, helping to maintain or increase the amount of muscle, as well as the quality of the muscle,” he said. Former athletes or people who have performed strenuous labour, and who had a balanced diet when they were younger, will often have a high peak muscle mass. This is carried forward as they age, he said. But those who have been exercising from young are also not immune to muscle loss. Bicycle store owner Joe Chua, 52, who has been participating in extreme sports like triathlons and Iron Man races for the last 15 years, started noticing changes in his physical fitness about three years ago. The last incident happened at MacRitchie Reservoir Park three years ago when he tripped on a stone and broke his collarbone during a night run. But Mr Chua, who is married with three sons, is not deterred and runs a total of 30km and cycles 100km every week. “As long as I balance my diet and nutrition, I can still do extreme races,” he said. While muscle loss occurs naturally with ageing, it can be more severe or accelerated in people who do not exercise or eat a balanced diet to build and repair their muscles, said Dr Carol Tan, a geriatrician from The Good Life Co-operative at Mount Alvernia Hospital. “A lot of attention has been paid to bone health, but muscles are equally important if we want our seniors to stay strong and independent as they age,” she said. Dr Melvin Chua, head of Sengkang Health’s department of general medicine, geriatric medicine and internal medicine, said that exercise and eating sufficient protein should be enough to address problems related to muscle loss. But he added that seniors who experience weight loss, falls or worsening mobility should seek medical help. This is because there may be underlying medical issues which are accelerating the muscle loss.